More and more women in England are running and it’s not just young women who’ve caught the running bug. 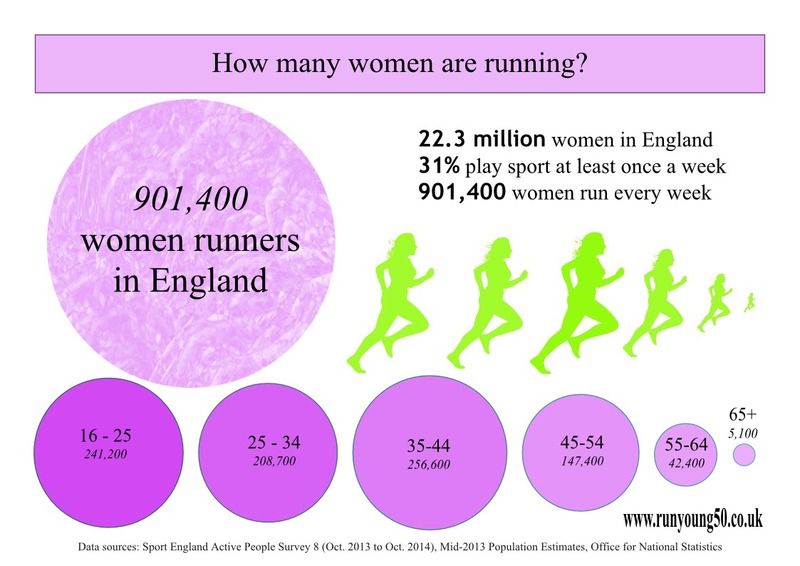 A year ago I looked at the Sport England Active People Survey for 2012/13 and concluded that there were nearly one million women running in the UK. The latest full year figures (2013/14) show a further increase in the number of women running. According to the data just over 4% of women aged 16+ in England are running at least once a week. The Active People Survey is the largest survey of sport and active recreation ever carried out in Europe and has been conducted since 2006. The survey contains a wealth of data which is made available via the Sport England website. If you love obscure facts there are plenty in here. Keen to know how many people play frisbee? Apparently the answer is only 0.03% of the population which equates to 12,300 people. Over the eight years since the survey began participation in swimming has declined, whereas athletics (including road running) and cycling have grown in popularity. There are more women aged 35 to 44 age running than in any other age group. 7.13% of women in this age group are running at least once a week. There are also more women runners in this age group than in all the older age groups put together. The decline in participation after 44 is still marked with the percentage of women who run regularly dropping from 7.13% to 3.87% of women aged 45 to 54. However, I was particularly pleased to see that the age group that I fall into, women aged 45 to 54, is the one with the rate of participation that has increased the most, with nearly 33,000 more runners than last year (a 0.8% increase in the percentage of women participating). Does this suggest that the women in the younger age group are continuing to run as they grow older? Or perhaps more women are starting running in their late forties and early fifties? Like me several of the women on my list of bloggers took up running at this age. What about you – when did you start running? Featured photo of women racing courtesy of John Oldfield, July 2015.